I made my first Sewtogether Bag! I love this bag so much, everything I need and more fits perfectly in it. My daughter was so jealous I had to make one for her too, in one evening!!! I purchased the pattern by Sew Demented on Craftsy, but I followed the Sew Along tutorial from The Quilt Barn. I really recommend to follow her tutorial, it makes it really easy. Some bits were quite tricky, but just make sure you have plenty of time, no interruptions and tons of patience and perseverance… It’s worth it! I also made a quilt for a customer. It was ordered for a friend. I really like how it turned out. I loved when my customer was giving me some input as well as free rein on the design. She wanted squares, and the fabric choice was very specific because it had to carry a lot of meaning. There are some embroidery bits like the name of places where the family lived under the squares with house prints, and other names of places that mark important events in their life. I also quilted the names of their four children among the steepled quilting design, so they are quite camouflaged and keeps all that information quite private and unnoticed. I love purchasing fabric for making these bibs, there are so many cute prints! I try to have a good selection of neutral, colourful ones, as well as boyish and girlish ones. I am still making a more and they are all being listed in my Etsy shop. The good news is that if you would like to get one for your little one, or a little one that you know, you will soon have the chance to enter a giveaway to win it. If you follow me on Instagram (you’ll find me under @elpetittalleretsy) you might have seen already some hints about this. Well, I’m inviting you to pop over to Faye’s blog, BabyLedBlog, where you will learn about great recipes and food related tips for babies and toddlers and their mamas and papas and wait for an interesting post this week about the Superbib. Come back to check or follow me on Instagram and Facebook for updates! Have you ever used stripes for binding a quilt? I love stripes! and I think they work so well for finishing a quilt, if it’s not on its borders I would definitely use it for the binding if I can. 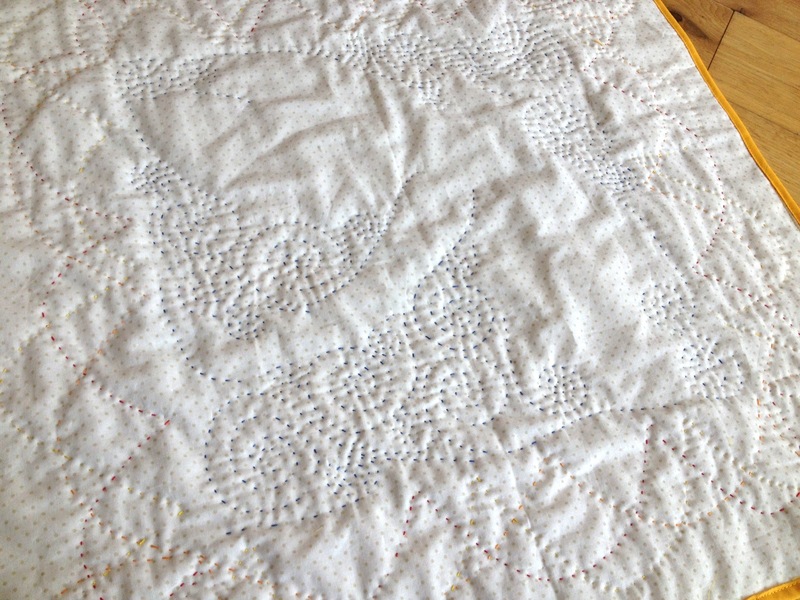 I am making a custom quilt at the moment and I have been taking a few snap shots in some of the stages so I can share a few tips. Here’s the first one: preparing your stripy binding tape. So here we go. 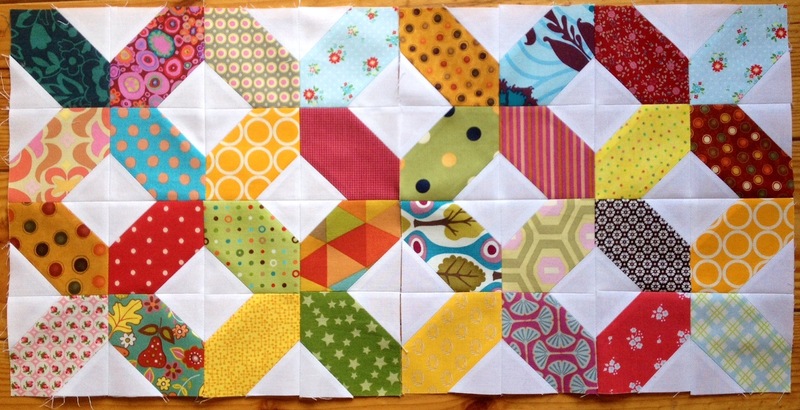 After you cut all your strips (I always cut 2.5″ wide by WOF and here I am using Funfair Colour Strips by Stof). Now place it onto the strip that lays horizontally, with right sides together (RST), and making sure that the horizontal top sideline of the pink stripe is aligned with the top edge of the bottom binding strip. You will see in the photo below that the edge of the strip on top is also aligned with the sideline of the vertical pink strip on the bottom. 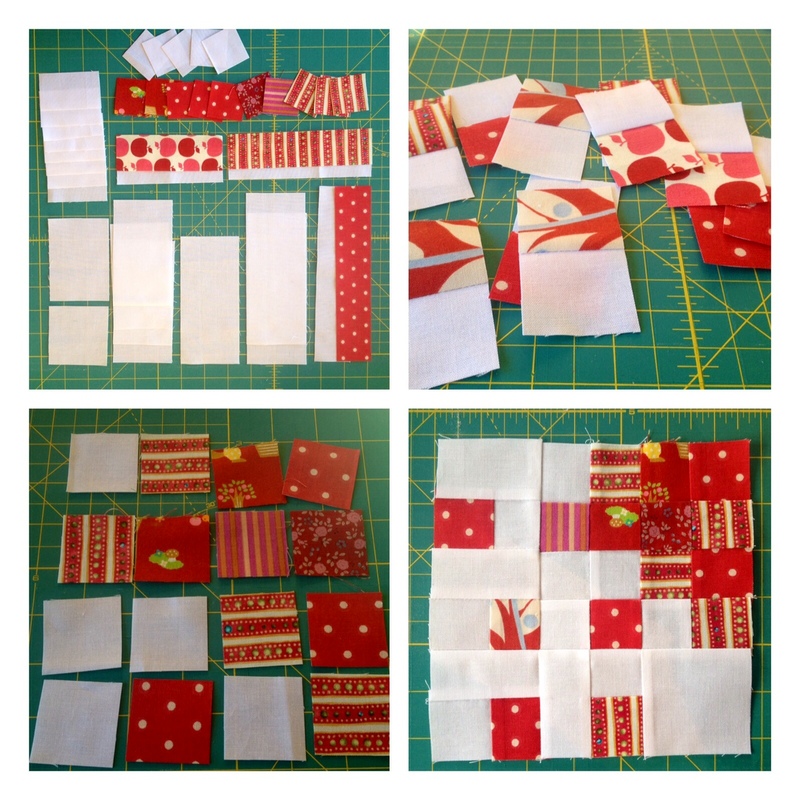 Pin the two strips in place to prevent them from moving and draw a line from the top left angle to the right bottom angle to use as a guide when you are sewing. 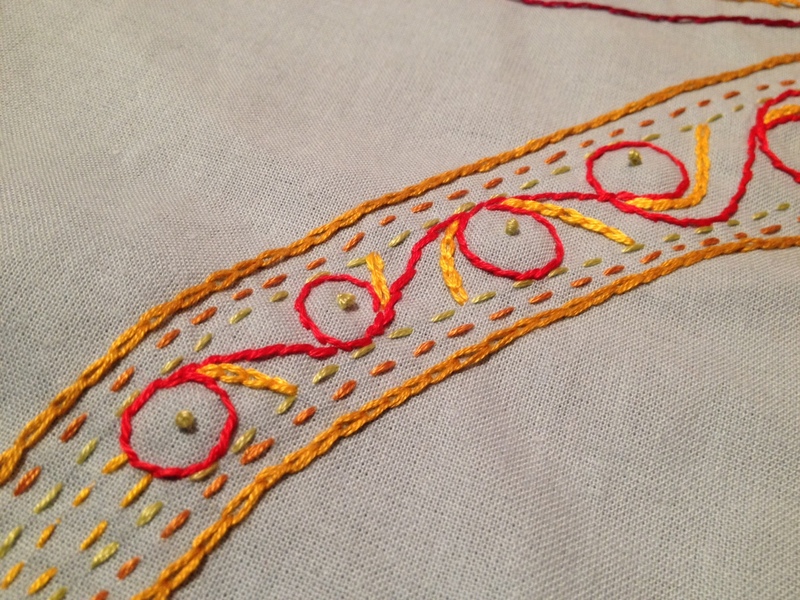 Sew along the line, backstitching at the start and the end and cut about 1/4″ along the seam. Press the seam open and cut the excess tips on the sides. Now you have a continuous stripy binding tape with matching stripes! 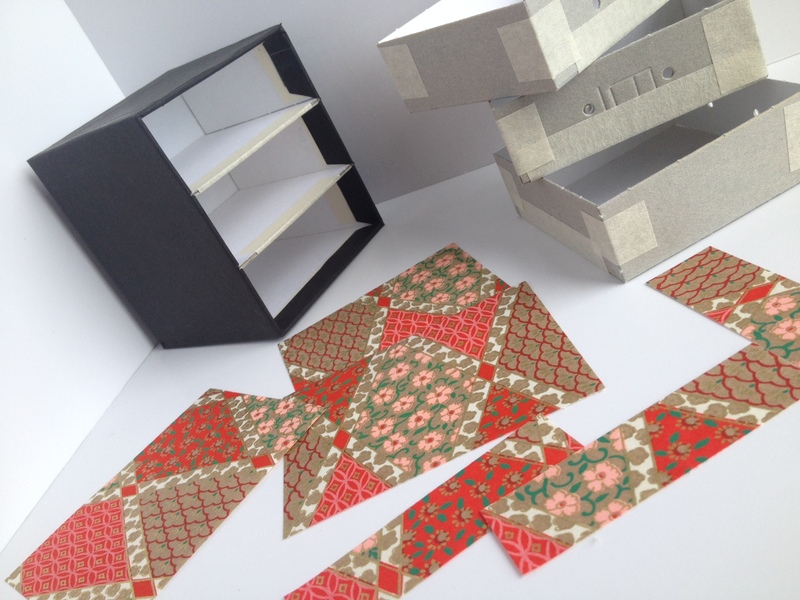 Have you got any tips on stripy binding? Or maybe on how to make binding altogether? You might like to share them, just write in the comment box! Oh yes, we’ve had a great time. I was busy making cards and sending orders to customers, I’m so grateful I get to sell my work on Etsy and now in a local craft shop too! It is, really, so nice to hear what people say and how much they like what I make. It just keeps me going! And in between of all this, I was making the gift for my Big Stitch Swap partner. The project had to have a good amount of hand stitching done, it could be a bag, a zipper pouch, a mini quilt… When I received the details about my partner, she mentioned she likes mini quilts, so this is what I made. I draw a dragon fly onto the fabric, inspired on a mobile I have. My partner said she likes anything scrappy and colourful, so I opted for nice warm fiery prints to frame the embroidered panel. I was using different stitches that I’ve been learning from this site. And I was making it up all along. 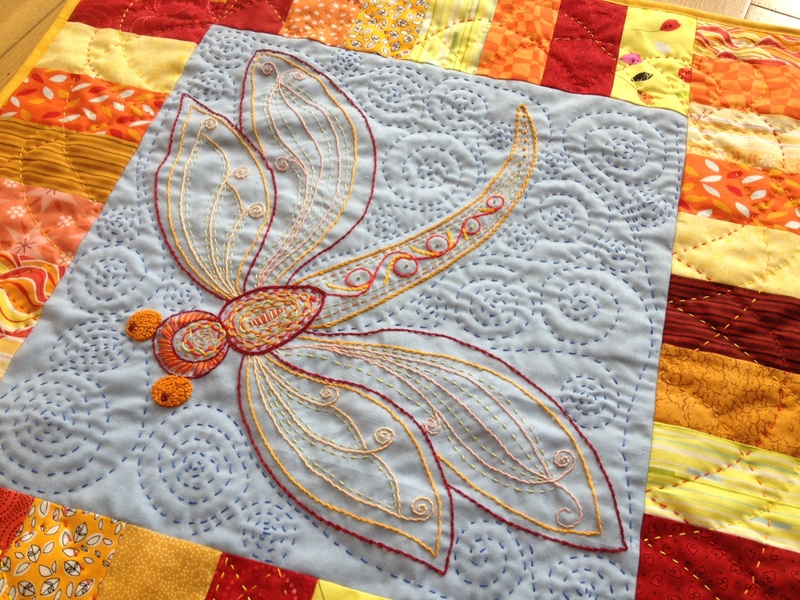 Mins you, you can get easily carried away with the embroidery and the hand quilting! 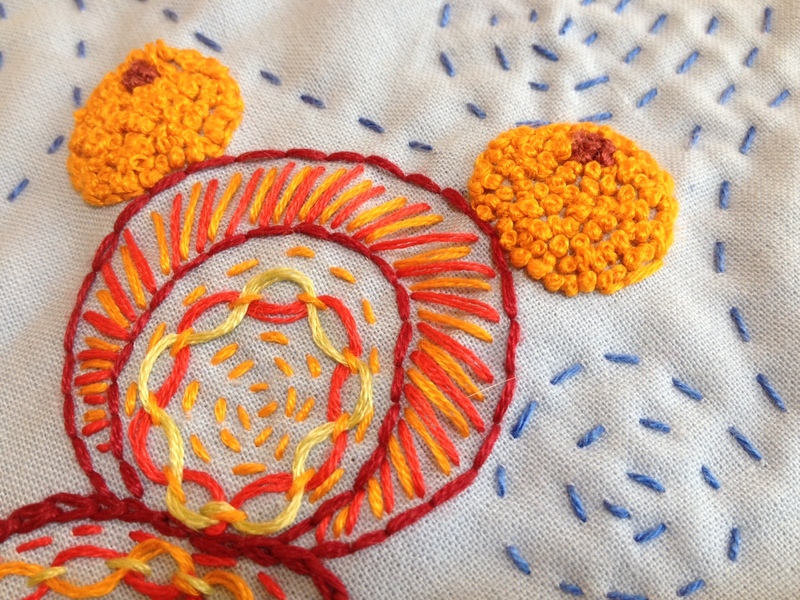 I like these interlaced stitches that let you play with different coloured threads. The hand quilting… I suppose those Sashiko coasters I’m making are helping me to get a steady regular stitch, but still, it is not the same when there is batting in between, so they are not as regular as I wanted them to be. I used a variety of Anchor and Fabra & Coats threads for embroidery and DMC perle cotton n.8 for the hand quilting. I didn’t mark any lines for the quilting like I did for the embroidery, so I can see now that it is a bit wonky all over the place, but I think it adds to the charm of being hand stitched all over. I was thrilled when I received my swap gift from another participant, I just love it so much! I think I was very lucky to get such an amazing piece of art too. I will show it to you next time and I promise it will be very very soon. Hi everyone! I have a few things in progress to show you this week. The postman has brought me a few goodies and I’m all excited thinking what will I do next! 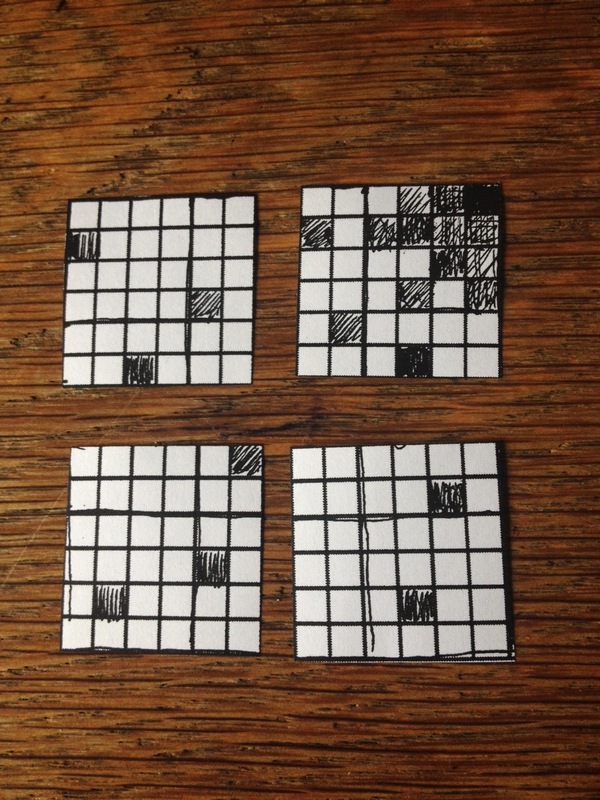 It is funny how it looks… I draw the idea on graph paper. Then, instead of drawing 11 more blocks to see how the whole quilt would look like, I just photocopied it and cut them all out. I could play around with different arrangements but in the end I stuck to the original plan, which is a quilt with 6 stars clusters. 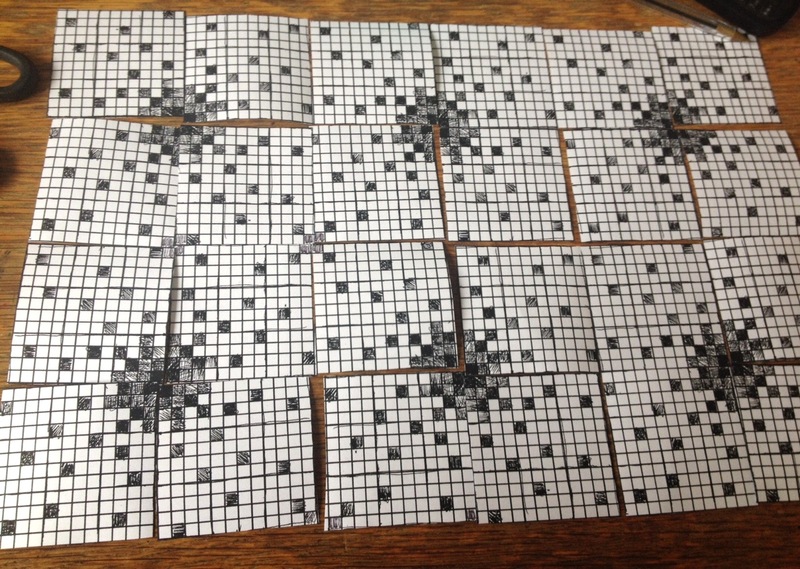 The block measures 12.5″ and is divided in 4 squares, and each of them in 3 columns. 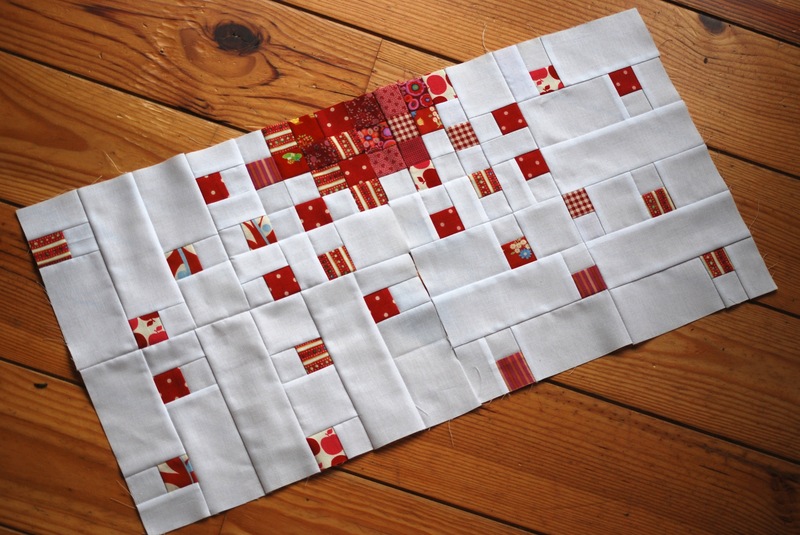 The red scraps are 1″ finished squares and the white background pieces vary in size. 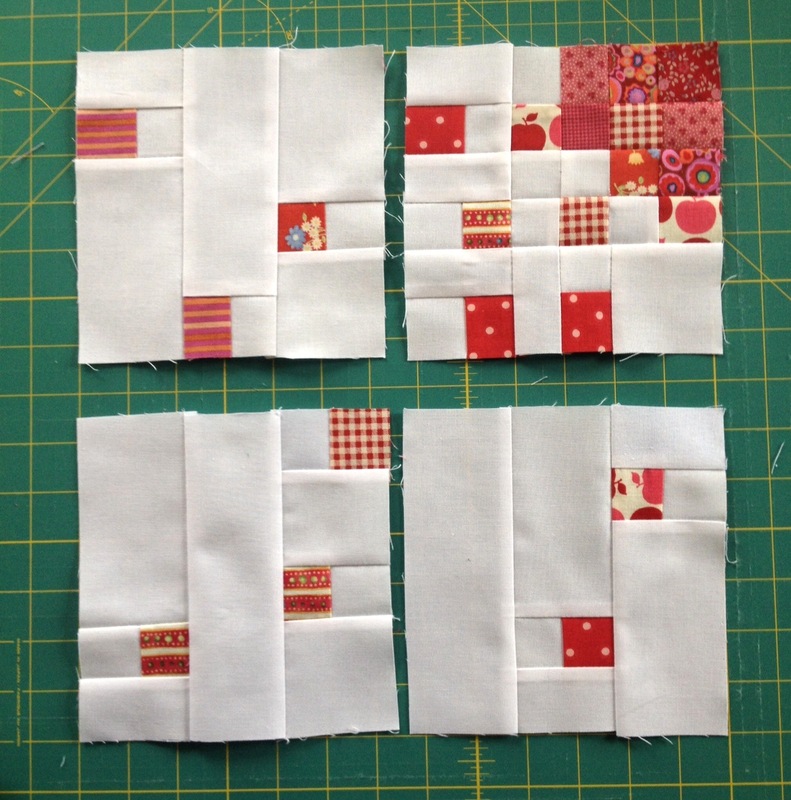 Here’s my two blocks using red scraps and Kona white. Tomomi was very nice and she included a beautiful handmade little drawstring pouch. Isn’t it amazing? Look at the detail of the log cabin block! Thank you so much Tomomi for your generous gift! I am still organizing and tidying my sewing room and among all the bits and bobs I found 2 kits to build a chest of drawers and an octagonal box that my sister had bought me while she was visiting Japan. 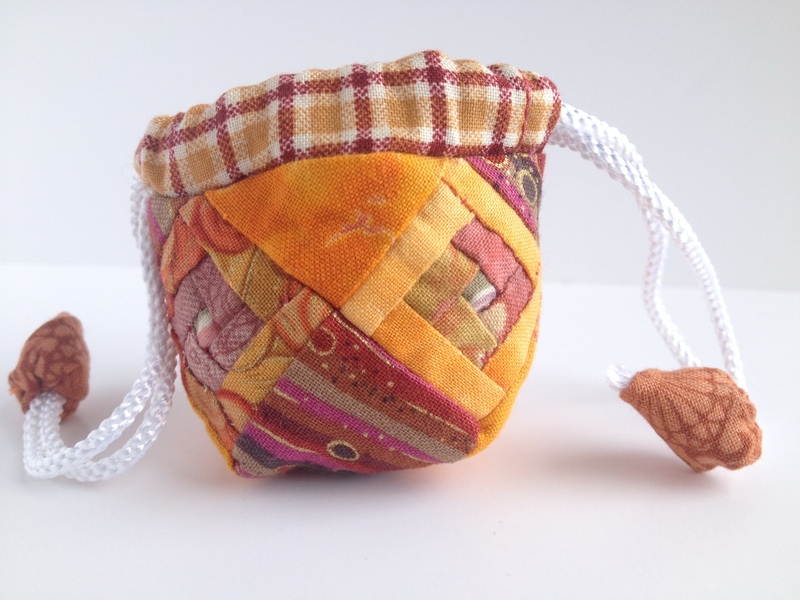 I am not sewing these days because I want to have the space ready, so this is a great way to have my hands occupied and quenching my creative bug. Then… another little package was accompanying Tomomi’s one! I was the lucky winner of Sarah’s Facebook giveaway for a patchwork cushion cover kit from Seamstar, one of her sponsors. Seamstar is an online shop where you can sign up for a monthly craft club box. You’ll receive all the supplies you need to complete a monthly project together with instructions. It is a brilliant idea, isn’t it? So here’s my latest addition to my to-do list. 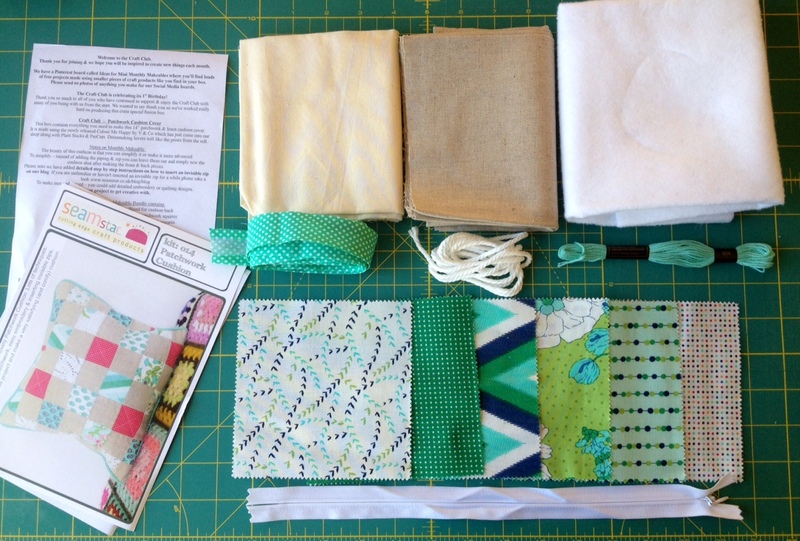 The kit contains 6 coordinating charm squares, piping cord, binding, linen, calico cotton, an invisible zip, thread and batting plus the instructions to follow. I’ll jump into it as soon as I can! At that’s all for this week… I’ll keep working on my Japanese themed crafts while drinking some Gen Mai Cha! June already! Well it’s time to show off the 2 beautiful blocks that my Bee Sisters requested for April and May. 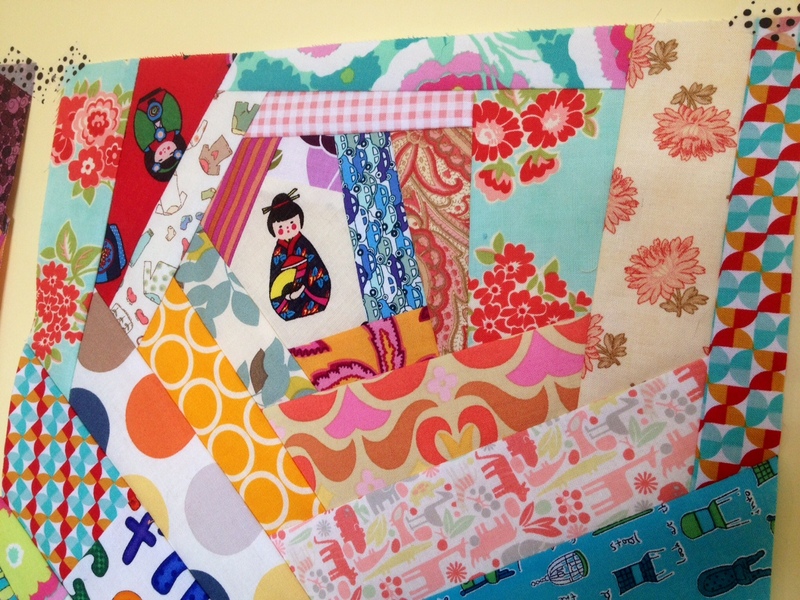 They are the kind of blocks that look great on their own, I mean that you could make a bigger version and turn them into a cushion cover, a mini quilt or a placemat (actually, Tomomi did make beautiful placemats with the Road to Tenesse design that Erin, the May Mama Bee, chose. 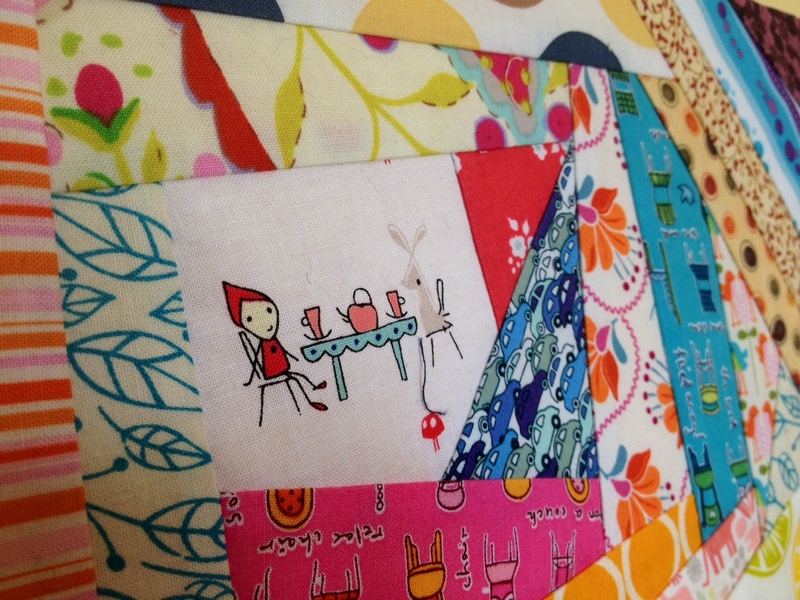 I also liked the fussy cutting that Anna‘s block called for and all the random scrappy bits added around. 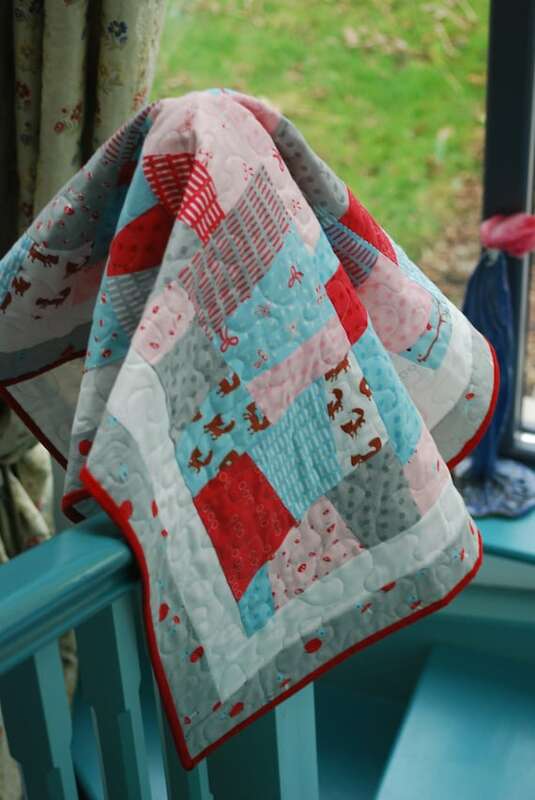 I don’t know if it’s only me or what, but even though I like the scraps I have, after all it is fabric that I bought and obviously love, I feel that everyone else’s blocks have such lovely fabric choices! I probably need a new scrappy stash! I’m so loving being part of this Bee! I was thinking that I might make one extra block of each month again, I’ll quilt them and bind them and I’ll have them hanging on a hemp string with wooden cloth pegs all around the walls on my sewing room to decorate. Wouldn’t that be nice? I’m still thinking of redecorating (I should probably say decorating only because it is really bare) the whole room. I think the whole house needs painting, outside and inside!!! 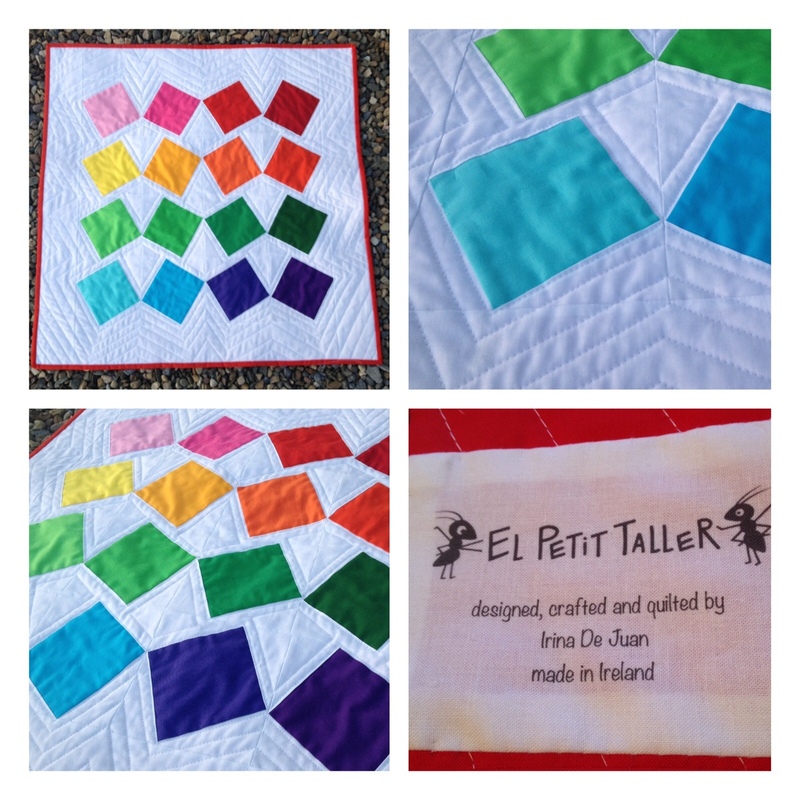 So we have had January, February, March, April and May blocks… June is my month and my block will be shown this week on the Modern Quilt Guild of Ireland’s blog. I designed it back in January, after many sketches and checking out many of my quilting books and magazines. At the end I opted to design my own one inspired on a scrappy quilt I saw while browsing Google Images for modern quilts and some photos of Supernova stars from an astronomy book that lays around the house. It is quite different from all the blocks that have been made up until now, in that it doesn’t really “say” anything on its own, because it is part of the bigger picture that makes the quilt. I’ve been worrying a bit about it, especially after seeing that every block was much more unique and pretty straight forward when it came to read instructions. Let’s see how it goes… I hope they find it interesting somehow! Oh yes, I did mention winnings on my post title, didn’t I? I’m so happy to say that I was lucky during the Sew Mama Sew Giveaway this year! I haven’t won a giveaway for a while and I was thrilled when I received an email from The Crafty Kitty telling me I had won one of her prizes: a FQ bundle of Mod Basics Organic Cotton fabric in yellow. 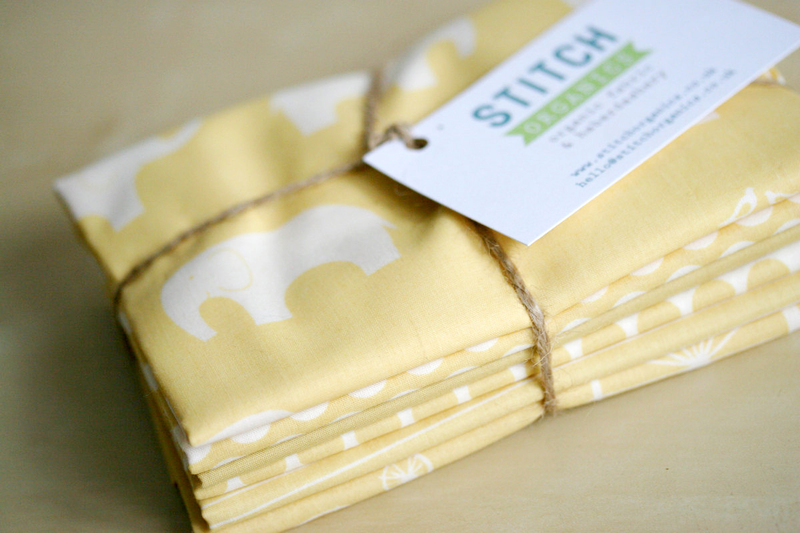 I LOVE this pastel yellow, the elephants are so cute and the dots are so lovely. I think I know how I am going to use some of these already. 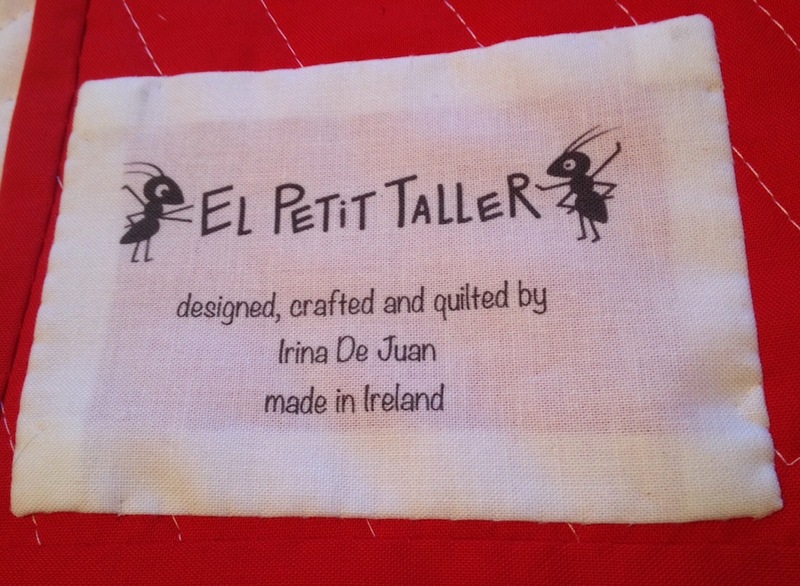 At the moment I am trying to experiment with different designs of zippered bags and pouches, combining linen and embroidery, and I think this organic fabric will be a perfect match for my Spanish linen. The other giveaway I won is a set of 12 small spools of Aurifil thread! Although I didn’t participate by entering a quilt at the Blogger’s Quilt Festival that Amy organizes every year (I did in the past and blogged about it here), I wrote a comment which was randomly chosen to win one of a few different prizes. What a nice surprise I had yesterday when I received the news from Amy. I’m quite excited to try this famous cotton Aurifil thread. Yep, believe it or not, I still haven’t tried it yet, one reason being that I have so many other thread spools already… But I must say that a super generous crafty colleague gave me a few polyester Aurifil and I really like it. I am really looking forward to receive it! And that’s all for this week. I am still working on my Summer Fair stock, I tackled some tin whistle cases already and more quilled cards. I don’t know if I’ll be able to meet my goal for the weekend as I am juggling it with my daytime (and night time sometimes) job and the kids… oh, time time time, where can I buy more of it??? Happy St.Patrick’s Day! I hope you had a nice day. We stayed on the island, went for a walk, had scones with cream and jam… For a change it didn’t rain!Hooray! That means no rainbow in the sky but there was one in my house! 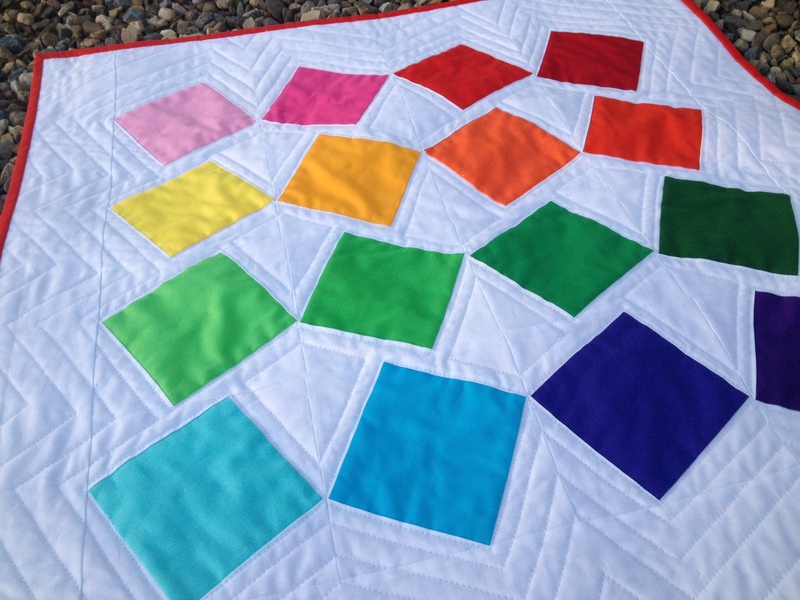 I have finished the third Rainbow Wonky Squares Quilt. Oh, how I love it! It is ready to be posted to America. I think it will look so pretty as a wall hanging for a nursery, and I hope both mummy and baby will like it as much as I do! Feliç dia de St Patrici! Avui ens hem quedat a casa tot el dia, hem anat a passejar, hem menjat scones amb nata i mermelada… i no ha pogut! (sempre plou per StPatirci…) aixo vol dir que no hi ha hagut cap Arc de St Marti, pero en canvi el tenim a casa! 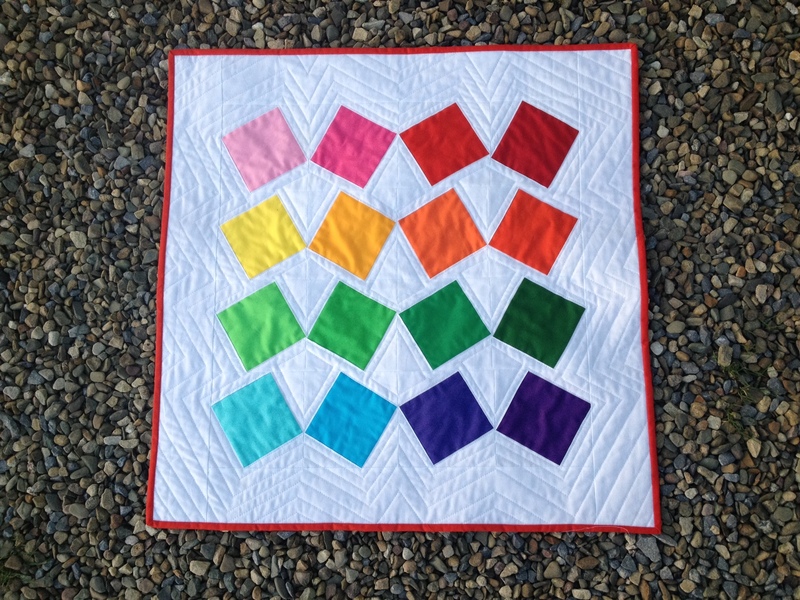 Ja he acabat el Rainbow Wonky Squares Quilt, com m’agrada aquest quilt! Ja esta llest per a enviar a America. Crec que quedara tan bonic penjat a la paret de l’habitacio on ha d’anar. Espero que tant a la mare com al nado els agradi tant com a mi. There is some exciting things going on too. I am working on my logo, labels, business cards, banners, etc… it takes so long! So now at last you get to see a small sample of it and know who are the main characters of El Petit Taller. My little ants!!! You see, the first name I thought for my blog was La Formigueta (the little ant), because I loved making those quilled ants and that’s how I saw myself… working like a laborious ant in my sewing room… but alas, that name was taken! So my sewing room got the name instead, The Little Workshop it is. Some English speakers don’t get it (and why should they), I know, and they thing Taller is in English (like the opposite of shorter) and that together with Petit… well, it doesn’t make much sense… does it? So now you know, taller is pronounced “tayeh”, and it’s the word for workshop! 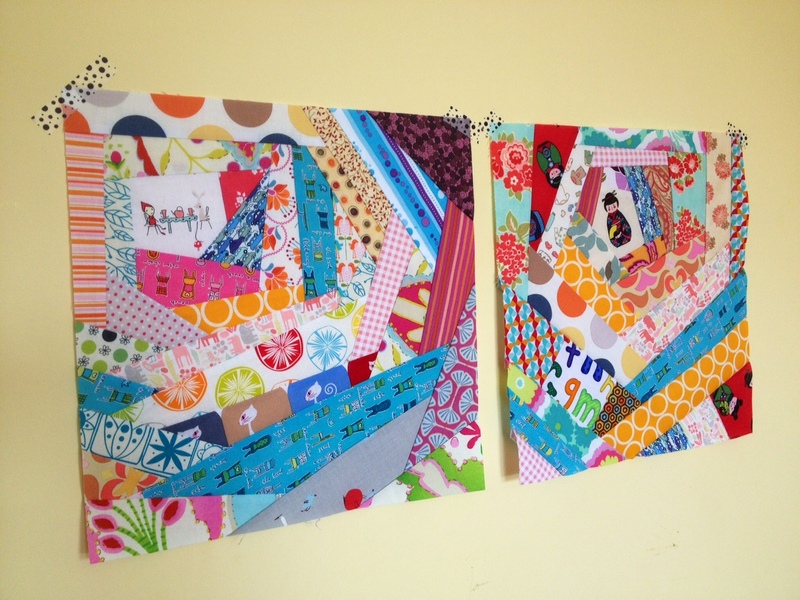 So there you go, here’s the story of my blog/shop’s name, my ants and my Rainbow Quilt! Doncs aqui us deixo… amb el meu Arc de St Marti i les meves formiguetes…!